SBR is excited to be the Inland Empire's premier location for adrenaline junkies with Cosmic Karting every Friday and Saturday night from 5PM-Midnight for all ages. San Bernardino Raceway is excited to be the Inland Empire's premier location for adrenaline junkies. Our gas powered go-karts are geared towards providing you the ultimate racing experience. It's safe and it's fun for the whole family. Speak with an SB Raceway Representative. Ask us a question or event inquiry. We offer affordable birthday party packages for ages 8 and up that provide a safe, wholesome fun for your family and friends. After attending a friends party at SB Raceway our Lil CarGuy wanted his to be there also, wasnt sure what to expect at first but it was AWESOME! Safety first!! I like a place that emphasizes safety and is well organized especially if you're zooming by in mini race cars at 40mph. Had a great time with my 10-year-old grandson and his friend from school. We went on a Thursday afternoon and got a private lesson plus two races. 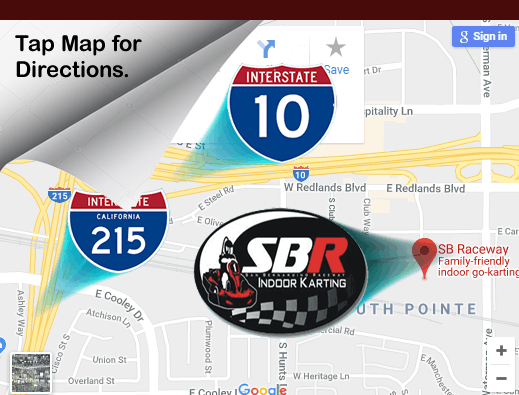 SB Raceway is conveniently located where the 10 fwy & 215 fwy meet. Tap map for driving directions. The facility is located in Everest Center, right next to Everest College. SBR is one block from 10 freeway and one block from a Starbucks, so you can drop your kids off at our safe facility and have a cappuccino at Starbucks while they race.